BYOD isn’t just a trend; it’s the future of learning. It’s incredible how quickly the paradigm has shifted toward bring your own device. Educators are recognizing the significance and necessity of digital devices on the way this generation learns. 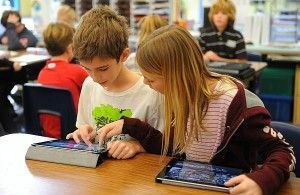 Schools want to prepare their students for the future so what better way to do so than with BYOD (Bring Your Own Device). 1. BYOD allows student & teacher to swap roles to create more collaborative classrooms. 2. Students already live and breathe technology outside of school so why not utilize their beloved mobile devices to get them more engaged in learning? 3. BYOD offers possible cost savings since fewer school devices are needed. 4. Students use the device they have selected to complete their work. Hence they are probably more willing to actually do it. 5. BYOD offers opportunities for additional learning outside of school at times the students choose. 7. Lessons can be customized to each student to support independent learning and progress. 8. It provides opportunity for teaching respectful/appropriate use of mobile devices which they will be using as adults and future professionals. 9. Schools can save money and student’s backs by offering ebooks that are more recent and stimulating. 10. 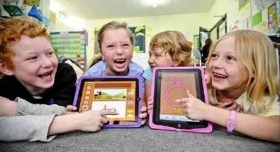 Most importantly BYOD offers more collaborative education and creates more enthusiastic students! BYOD isn’t just one day deciding to let kids bring their personal devices to school. It entails careful planning, particularly regarding your school wireless network infrastructure to become a efficacious solution. If you’re a school considering a BYOD program and have any concerns or questions, we offer a free consultation to help get you pointed in the right direction, just Contact Us Here. We also have some great resources on the site like our Free Guide to Preparing your network for the iPad. Good luck!